Have you ever had that uncomfortable feeling of standing out in a crowd ... for all the wrong reasons? Such is the case with the new AT&T 4G commercial. 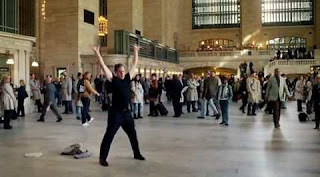 The clock strikes the magic hour of 12 and the businessman in the train station strips out of his trench coat, and exuberantly breaks into dance ... to the awestruck silence of the subway crowd. It finally dawns on the flash mob dancer that something is a bit remiss with the situation. He glances down at his phone, only to see the urgent message: "FLASH MOB MOVED TO 12:30." Up comes the AT&T super: Don't be the last to know. Get it faster with 4G. Contemporary message, both from the perspective of technology and pop culture. The "rug pull" at the end brought a smile to my face. Bernie The Brewer Is Missing - Help Find Him!